Expect an eclectic mix of music when a new music night makes it debut at The Lightbox on Bridge Street on Saturday. A cafe by day, the new venue which only opened last month brings more of a wine bar with nibbles and sharing platters by night, Thursday to Saturday. And starting this weekend, DJs Zed and Jim will be bringing their Eclectic Ballroom to The Lightbox every Saturday from 9pm playing the best in disco, soul and funk. The boys get to play the likes of Glastonbury but have built up quite a following in recent years here in their home city at the former North Street Bar and latterly Eden Room at The Solstice. “We are looking to recreate what we had at North Street for four years or so,” said Zed. “We have had a residency in the Eden Room for a year or two but we have never really been able to transfer the vibe we created at North Street. “Then a friend put me in touch with Eve, who has just opened this place . 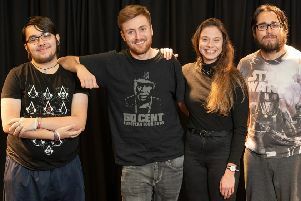 There’s a treat in store for lovers of acoustic on Saturday when King’s Cliffe Memorial Hall hosts a concert featuring some of the finest young musicians on the UK folk scene, to celebrate the release of an international album with a local twist. Jez Hellard & The Djukella Orchestra recorded their latest album, D’rect from the Shire, live in concert last year, at Northamptonshire’s now legendary concert series, The Sofa Sessions. The band will perform a wide repertoire of tunes, from celtic to tango, and a selection of poignant songs to soothe the soul in these heady times, served with a healthy dose of wit and wisdom. For tickets email thesofasessions@live.ie or call 07557382851.